The BMW Group showcases its visions of future mobility in the shape of the BMW i3 Concept and BMW i8 Concept studies. Unveiled for the first time, these concept vehicles provide a glimpse of the first electrically powered production cars from the new BMW i sub-brand, due to be launched as the BMW i3 in 2013 and the BMW i8 in 2014. The focus here is on solutions for improved use of parking space, intelligent navigation systems with location-based information, intermodal route planning and car-sharing schemes such as DriveNow. Following MyCityWay, ParkatmyHouse marks the second investment by the recently launched venture capital company BMW i Ventures in a company providing internet-based mobility services. Parkatmyhouse allows private individuals to use the internet or a smartphone app to rent out their private parking spaces on a short- or long-term basis. The world, and with it the sphere of personal mobility, is experiencing a period of radical environmental, economic and social change. A rash of global developments such as climate change, the dwindling availability of resources and increasing urbanisation call for a new balance between the demands of the planet and the desires of the individual. Fresh solutions are required to underpin personal and, most importantly, sustainable mobility. The BMW Group has responded to this situation with the creation of a sub-brand which meets the changing needs of customers head-on: BMW i.
BMW i is about the development of visionary vehicles and mobility services, inspiring design, and a new understanding of premium that is strongly defined by sustainability. With BMW i the BMW Group is adopting an all-embracing approach, redefining the understanding of personal mobility with purpose-built vehicle concepts, a focus on sustainability throughout the value chain and a range of complementary mobility services. In so doing, BMW i is also opening up new target groups for BMW and further strengthening the position of its parent company as a sustainable and future-oriented brand. “The purpose-oriented and sustainable mobility solutions from BMW i mark the dawn of a new era in personal mobility for the automotive industry.” (Ian Robertson, member of the Board of Management of BMW AG responsible for Sales and Marketing) project i – how BMW i was born. The BMW i brand world comprises vehicles and services developed since 2007 as part of project i, a BMW Group think tank set up to explore sustainable mobility solutions. Launched under the banner of the corporate strategy Number ONE, project i was charged with developing sustainable and pioneering mobility concepts. The intention of the initiative was always to generate a transfer of expertise into both the company as a whole and future vehicle projects specifically. The overriding goal of project i is to preserve the BMW Group’s position as the leading supplier of premium products and services for personal mobility in the future as well. To this end, the development engineers involved have always focused their attentions on the entire value chain. After all, it is not only the products of the future that should be sustainable; every parts-related process, every technology and every supplier is required to contribute to the positive sustainability rating of the products. As part of project i the BMW Group is currently conducting field trials in everyday conditions with vehicles running purely on electric power. These trials are unparalleled worldwide in their scope. The ongoing trials in the USA and Europe with a fleet of more than 600 MINI E cars are already delivering important feedback on the demands the series-produced electric vehicles of the future will need to meet. Added to which, a test fleet of over 1,000 BMW ActiveE vehicles – set for launch in the USA, Europe and China at the end of 2011 – will contribute valuable insights into the performance of these models in everyday use. The information gained will serve to deepen the existing knowledge base on the everyday use of vehicles with electric drive systems and to find out more about what customers want and need. Feedback from the customers trialling the MINI E and BMW ActiveE is channelled directly into the series development of the BMW i vehicles. The BMW i brand is now poised to enter the consciousness of the automotive public with two new vehicles. First up is the BMW i3 Concept. Previously known as the Megacity Vehicle, the BMW Group’s first series-produced all-electric car focuses squarely on the mobility challenges of the future in urban areas and, as the first premium electric vehicle, reinvents hallmark BMW attributes for the drivers of the future. Then comes the BMW i8 Concept, a sports car of the most contemporary variety – forward-looking, intelligent and innovative. Based on the BMW Vision EfficientDynamics concept car, its unique plug-in hybrid solution brings together a combustion engine and an electric drive system to create an extraordinary driving experience complemented by extremely low fuel consumption and emissions. BMW i3 Concept – dynamic, compact, emission-free. The BMW i3 is a well-resolved all-round concept, with every detail conceived and optimised to fulfil its eventual purpose. Central to its design is the innovative LifeDrive architecture, the key to the BMW i3 Concept’s appeal as a light, safe and spacious car. Innovative use of materials and intelligent lightweight design not only enable the i3 Concept to travel long distances on a single charge and provide superb safety in the event of a collision, they also help give the car its excellent driving dynamics. The secure arrangement of the battery in the Drive module gives the vehicle a very low centre of gravity and optimum weight distribution. The electric motor over the rear axle – which generates output of 125 kW/170 hp and impressive torque of 250 Nm (184 lb-ft) from a standstill – and a small turning circle combine to deliver pleasingly crisp driving characteristics and give the driver a very immediate experience of the BMW i3 Concept’s lightweight design. The BMW i3 Concept accelerates from 0 to 60 km/h (37 mph) in under four seconds and from rest to 100 km/h (62 mph) in less than eight seconds. The extremely direct sensation at the wheel is expressed in outstanding agility at low speeds and during turning manoeuvres, and makes parking in tricky situations that much easier. The Life module conjures up a feeling of space inside the car more generous than even the latest conversion vehicles can offer. Select materials lend the open and airy cabin a lounge-like character. The use of renewable raw materials is another defining characteristic of the interior, offering passengers a further means of “experiencing” the sustainability of the vehicle. Elements of the instrument panel and door panelling are visibly made from natural fibres, while the naturally tanned leather of the seats creates a lounge-style ambience. Together, these materials provide an appealing contrast to the clear, “floating” forms of the instrument panel and door elements, and lend the interior a strikingly modern feel. With the drive components located in the Drive module, there is no centre tunnel running through the passenger compartment. This allows the two front and two rear seats to be connected with each other by a continuous seat surface, which allows for ease of entry and exit via the front passenger side of the car and means you can park up close to walls, for example. With four seats, wide-opening opposing “coach” doors, boot capacity of around 200 litres and an additional functional compartment in the front, the BMW i3 Concept is neatly equipped for the demands of everyday use. However, the electric motor developed by BMW and the optimised lightweight design of the LifeDrive architecture cannot take all the credit for imbuing the car with such efficiency and enabling it to travel such long distances on each charge. Indeed, the ability of the car to recoup energy while on the move and special range-extending functions, such as ECO PRO mode, also add miles to the clock. With ECO PRO mode activated, all the vehicle functions operate with maximum efficiency. For example, the accelerator mapping is tweaked to limit the output summoned when the driver flexes his right foot, and the climate control functions also use as little energy as possible. Added to which, sophisticated aerodynamics and slim, low rolling resistance wheels minimise resistance to the car’s forward progress and maximise its range. Innovative connectivity functions create a seamless connection between the BMW i3 Concept and its customers’ lives outside the car. Remote functions accessible via a smartphone enable owners to find their vehicles, flag up nearby charging stations, allow battery charging and preconditioning at the touch of a button and supply information on the current status of the vehicle. Meanwhile, intelligent assistance systems ease the stress on drivers in monotonous city driving situations and allow them to arrive at their destination more safely and in a more relaxed state of mind. The BMW i8 Concept and the fascinating approach that underpins it embody the vision of a sustainable contemporary sports car brought to life. Its innovative plug-in hybrid concept combines the modified electric drive system from the BMW i3 Concept – fitted over its front axle – with a high-performance three- cylinder combustion engine producing 164 kW (220 hp)/300 Nm (221 lb-ft) at the rear. The electric motor in the BMW i8 Concept is a full-capability unit which can also power the car on its own, if required. However, working in tandem allows the two drive systems to display their respective talents to the full, delivering the performance of a sports car but the fuel consumption of a small car. Acceleration of 0 to 100 km/h (62 mph) in under five seconds combined with fuel consumption in the European cycle of under three litres per 100 kilometres (approx. 94 mpg imp) and average customer fuel consumption of between five and seven litres per 100 kilometres (40.4 – 56.5 mpg imp) – even when driven hard – are figures currently beyond the capability of any vehicle powered by a combustion engine of comparable performance. Thanks to its large lithium-ion battery, which can be charged from a domestic power supply, the BMW i8 Concept can travel up to 35 kilometres (approx. 20 miles) on electric power alone. A large proportion of short everyday journeys can therefore be completed with zero emissions. The car’s electric-only mode allows it to enter emissions- capped central areas of cities with access restrictions in place for petrol or diesel-powered vehicles. The i8 Concept’s efficiency rating is further enhanced by its ability to generate energy at both axles. The electric motor at the front axle recoups maximum energy every time the driver brakes, while a high-voltage alternator hooked up to the combustion engine charges the battery, if required. Added to which, the 2+2-seater offers enough space for four people, giving it a high level of everyday practicality. The emotional design of the BMW i8 Concept ensures its qualities are clear for all to see. Its dynamic proportions give the BMW i8 Concept the appearance of surging forward before it even turns a wheel and lend visual form to its extraordinary performance. The sophisticated concept behind the upward- swivelling doors fixed to the A-pillars underlines the car’s sporting capability and opens up access to the front and rear seats at the same time. A series of air inlets allow the air to flow through and around the vehicle to optimum effect, ensuring extremely low drag. They also add visual emphasis to these advanced aerodynamics. Airflow plays an extremely important role at the rear of the vehicle as well. Intakes behind the passenger cell and at the rear provide a cooling flow of air through the engine compartment, while outlets in the rear diffuser and the flow of air around the rear wheels ensure the car is extremely efficient in terms of lift and downforce at both axles. The weight of every component inside the BMW i8 Concept has been minimised down to the very last detail, allowing the extra weight of the electric drive system and battery to be cancelled out. The BMW i8 Concept therefore presents the ideal environment in which to sample this very special drive concept on the road. The passengers sit – in typical sports car style – in an extremely low and enclosed position inside the CFRP-constructed Life module (mounted above the Drive module). The sporting character of the BMW i8 Concept continues into the interior. Boasting a driver-focused environment unmatched by any BMW Group vehicle before it, the BMW i8 Concept immerses the driver fully in the unique driving experience. The purpose-built driver’s position is geared squarely towards the person at the wheel and gives optimum access to all information and controls. The three-dimensional displays are crystal clear and flash up the relevant information for the driving situation at hand. The interior as a whole is defined by the functionality of a classical BMW sports car and majors on lightness and ease of use. The BMW i8 Concept is the sports car for a new generation – pure, emotional and sustainable. intelligent navigation systems with local information, intermodal route planning and premium car-sharing. In addition to service packages developed in-house, the BMW Group is pursuing cooperations with partner companies as well as strategic capital investments with providers of mobility services. BMW i Ventures was established with this purpose in mind. The company aims to expand the product portfolio of BMW i over the long term with stakes in highly innovative service providers, such as MyCityWay and ParkatmyHouse. Purpose-built design – the LifeDrive concept. The construction of electric vehicles has, up to now, been based on the “conversion” approach. This involves integrating electric components into vehicles originally designed to be powered by a combustion engine, as in the case of the MINI E and BMW ActiveE test cars. However, this form of automotive electrification involves making complex modifications throughout the vehicle and therefore increasing its weight considerably. That is because the electric drive components place totally different demands on a vehicle when it comes to installation space and cannot be integrated into that vehicle without adding weight and compromising interior and boot space. Conversion cars thus do not represent the best long-term response to the challenge of e-mobility. The BMW Group engineers took a different approach, focusing squarely on the eventual usage of the BMW i vehicles in developing the LifeDrive concept. This new vehicle architecture meets the full range of technical requirements of an electric drive system (including a large battery), while keeping weight low, maximising range, creating generous levels of space, enabling supreme driving characteristics, and ensuring impressive safety for the battery and passengers alike. In contrast to vehicles with a self-supporting body, the LifeDrive concept essentially comprises two separate, independent functional units. The Drive module integrates the vehicle’s suspension, battery, drive system, and structural and crash functions into a construction made chiefly from aluminium. Its partner, the Life module, consists primarily of a high-strength and extremely lightweight passenger cell made from carbon fibre-reinforced plastic (CFRP). The use of this high-tech material across large sections of the car ensures that the Life module is remarkably light and, in so doing, helps to achieve both impressive range and improved performance. Added to which, the car’s handling is also much enhanced, and the functional connection between the Drive module and the torsionally rigid Life module lends it a very distinctive dynamic character. The use of CFRP on this scale is unprecedented. Indeed, with the creation of its LifeDrive architecture the BMW Group has taken lightweight design, vehicle architecture and crash safety into a whole new dimension. By avoiding the need for modifications to accommodate the electric drive components, the LifeDrive architecture ensures the car is no heavier than a conversion vehicle of similar size. Intelligent lightweight design and the innovative use of materials allows the LifeDrive architecture to cancel out all the extra weight added by giving the car an electric drive train rather than a comparable combustion engine. Another special feature of the BMW i3 Concept and BMW i8 Concept are their wheels, which are noticeably larger and narrower than those of their class rivals. Slimmer tyres generate far less drag and rolling resistance, reduce unsprung masses and, in so doing, allow the cars to travel further on a single charge and use less energy. Equally impressive as the vehicle architecture’s benefits in terms of weight and handling is its performance in crash tests. Here again, the combination of the aluminium in the Drive module and the Life module’s CFRP passenger cell demonstrates just how well lightweight design and safety can go together. Like the cockpit of a Formula One car, the CFRP passenger cell provides an extremely strong survival area. Pole impacts, side-on collisions and rollover tests highlight the impressive safety-enhancing properties of this extraordinarily robust material. While metal constructions require the addition of large energy absorption zones, special deformation elements in the CFRP structure allow large amounts of energy to be absorbed in an amazingly small area. Despite the heavy and sometimes concentrated forces, the material barely sustains a dent. Together, the high-strength CFRP passenger cell and intelligent distribution of forces through the LifeDrive module lay the foundations for optimum protection for the car’s occupants and battery alike. Both the BMW i3 Concept and the BMW i8 Concept have been designed around the innovative LifeDrive architecture. However, the geometric implementation of the concept differs in the two models, having been adapted to suit their different usages. The BMW i3 Concept features a horizontal-split variant of the LifeDrive concept optimised to accommodate the car’s electric drive system. Here, the Drive module provides the solid foundations for the Life cell, which is simply mounted on top. The driving element of the Drive module’s functional design is the battery, which is made as large as possible to give the car better range. Bearing in mind the size of the BMW i3 Concept’s battery, the most space-efficient place to store it was in the car’s underfloor section. There, it occupies the whole of the module’s central section, giving the car optimum weight distribution and a low centre of gravity and therefore enhancing its dynamics. The battery is penned in by aluminium profiles, which protect it from external impacts. Crash-active structures in front and behind it provide the necessary energy absorption in the event of a front- or rear-end collision. The electric drive system is, as a whole, much more compact than a comparable combustion engine, cleverly accommodating the electric motor, gear assembly and drive electronics – in space-saving fashion – within a small area over the driven rear axle. The BMW i3 Concept therefore features the optimum LifeDrive architecture configuration for a purely electric vehicle. The chassis of the BMW i3 Concept is also ideal for city driving. Its enviably small turning circle and direct steering responses are a recipe for outstanding agility, notably at low speeds. Rear-wheel drive allows the front axle to remain free from drive forces and therefore to carry out its steering function to optimum effect. These elements team up with the electric motor – whose impressive torque from a standstill provides exceptional traction – to produce extremely dynamic handling characteristics. The spacious Life module of the BMW i3 Concept allows the vehicle’s interior to boast a totally new design. The integration of all the drive components within the Drive module removes the need for a centre tunnel bisecting the interior, through which power would previously have been transferred to the rear wheels. The BMW i3 Concept therefore offers significantly more interior space than other vehicles with the same wheelbase and – through solutions such as a full-width seat bench – also allows the interior to be adapted extremely effectively to the needs of urban mobility. Added to which, a pair of opposing doors and the omission of B-pillars provide a large entry area for passengers – and a generous view into the cutting-edge interior for admiring eyes. The BMW i3 Concept offers comfortable accommodation for four passengers and, with around 200 litres of boot space, room for their luggage as well. Up front, underneath what would normally be the bonnet, the Life module gives the BMW i3 Concept a separate luggage area with space for the charging cable and other items passengers would rather not carry in the passenger compartment. The BMW i8 Concept sees the LifeDrive architecture concept adapted to suit the vehicle’s sports car character – i.e. primed to deliver leading performance and sharp dynamics. This interpretation of the LifeDrive concept takes its cues from the innovative hybrid concept of the BMW i8 Concept, which links up an electric drive system at the front axle with a combustion engine over the rear wheels to lay on an unparalleled driving experience. In a departure from the purely horizontal configuration favoured for the BMW i3 Concept, the LifeDrive architecture of its BMW i8 Concept sibling also features vertical layering in the front axle module, passenger cell and rear axle module. The drive systems powering the BMW i8 Concept are integrated into the front and rear axle modules, with the CFRP Life module providing the bridge between the two. As a plug-in hybrid, the BMW i8 Concept is not designed purely for all-electric propulsion, and therefore carries fewer battery cells than the BMW i3 Concept. These are stored in the Life module inside an energy tunnel, a structure similar to a central transmission tunnel. The front and rear axle modules therefore combine with the passenger cell and battery to form a functional unit, which adopts not only load-bearing responsibilities but also extensive crash functions. The location of the high-voltage battery in the energy tunnel gives the vehicle a low centre of gravity, and this enhances its dynamics. Together with the positioning of the motor and engine over the axles, the result is optimum 50/50 weight distribution. Intelligent lightweight design and the innovative use of materials produce extremely low unsprung and rotating masses, which is good news for the car’s driving dynamics, acceleration, range and fuel economy. All in all, the BMW i8 Concept offers the ideal environment in which to experience the special drive concept and distinctive sports car character of the BMW i8 Concept on the road. The BMW i8 Concept’s axles are designed to deliver optimum handling properties, in keeping with the car’s sporting profile. The multi-link front axle provides the ideal geometric platform for an extremely flat and aerodynamically efficient silhouette. The front axle construction is also designed explicitly to handle the twin demands of the steering and drive system. It eliminates any drive forces which may otherwise affect the steering, ensuring optimum handling in every situation. In the CFRP Life module passengers sit low down and enclosed – in classical sports car style – between the motor and engine. Between them runs the energy tunnel that intersects the interior. Swivelling doors fixed to the A-pillars provide large openings that allow access to both front and rear seats. Four seats make the BMW i8 Concept a practical everyday vehicle that brings together the full array of positive BMW attributes. Systematic lightweight design is a particularly important element of electrically- powered vehicles. An electric drive system (incl. battery) tips the scales at up to 200 kg heavier than a comparable combustion engine and full tank of fuel. And high vehicle weight is a major factor – alongside battery capacity –in restricting how far an electric car can travel on a single charge. As well as increasing such a vehicle’s range, lower vehicle weight is also a ticket to noticeably improved performance. After all, a lightweight vehicle accelerates faster, is more agile through corners and brakes to a standstill more quickly. Lightweight design therefore paves the way for greater driving pleasure, agility and safety. In addition, lower accelerated mass means that energy-absorbing crash structures can be scaled back – and that, in turn, saves weight. The aim of the development engineers was therefore to achieve the electrification/hybridisation of the vehicles without adding weight. Alongside the innovative LifeDrive architecture, other aspects central to the BMW Group’s success in cancelling out the extra weight of the electric components were systematic lightweight design and the innovative use of materials. The various components within a vehicle’s structure have to deal with an extremely wide range of demands, which can only be addressed to full effect by a variety of construction methods. For each component, the BMW Group engineers therefore select the material to fit its usage profile and the demands placed on it, so that battery weight is no longer an issue. In order to meet the engineers’ ambitious aims, every component has been rigorously developed, examined and, if necessary, modified to optimise its functional effectiveness and minimise weight. Designing the components specifically for their particular purpose ensures the vehicles work as well and weigh as little as possible. CFRP plays a major role in reducing weight. The extensive use of this material – e.g. in the Life module of the BMW i3 Concept and BMW i8 Concept – is unprecedented in volume vehicle production. CFRP is at least as strong as steel, but roughly 50 per cent lighter. By comparison, aluminium would save “only” 30 per cent in weight over steel. All of which makes CFRP the lightest material available for vehicle body construction which does not compromise safety. As well as “conventional” CFRP components made from resinated carbon fibre weave, in some areas the BMW i8 Concept also contains specially woven CFRP structures known as “braided profiles”. Here, CFRP preforms are woven like a sock over a mould. This allows much greater design freedom, and fewer joints are required. Flush-fitting connections also make the profiles extremely strong. The braided profiles are therefore used in areas – such as the door sills, doors and A-pillars – in which greater strength is required, not least in the event of a collision. The special manufacturing process involved makes it extremely easy to optimise wall thickness (by adjusting the diameter of the mould). Much more complex forms can also be achieved without bonding or the use of connecting pieces and, most importantly, produce far fewer waste cuttings. Lower material usage also reduces the energy requirement. Two vehicles, two drive concepts. BMW i stands for a new concept in sustainable mobility and a new approach to vehicle drive system design. The BMW i3 Concept and the BMW i8 Concept, with their highly innovative and efficient drive systems, demonstrate how future mobility can be both sustainable and dynamic. The BMW i3 Concept and BMW i8 Concept are two entirely different vehicles, and this is reflected in their different drive concepts. In both cases the design and configuration of the drive systems are dictated by the individual character of the vehicle and its intended area of application. While the BMW i3 Concept is an all-electric vehicle and therefore optimally equipped for operation around town, the plug-in hybrid BMW i8 Concept combines its electric motor with an internal combustion engine to deliver a high level of performance. The common link between the two vehicles is their electric motor, which marks a move away from exclusive reliance on an internal combustion engine. These cars are “born electric”, and define a whole new concept in drive technology in their segment. The electric motor of the BMW i3 Concept is designed primarily for operation in an urban environment. Already tested in a pre-production version in the BMW ActiveE, the version of this permanently excited hybrid synchronous motor which will be used in the BMW i3 Concept has undergone further optimisation in terms of weight and driveability. It develops 125 kW/170 hp, with peak torque of 250 Nm (184 lb-ft). Typically of an electric motor, maximum torque is developed from standstill, in contrast to an internal combustion engine where torque increases with engine rpm. This makes the BMW i3 Concept highly agile and provides impressive acceleration. The BMW i3 Concept accomplishes 0-60 km/h (37 mph) in under four seconds and 0-100 km/h (62 mph) in under eight seconds. At the same time the abundant torque is delivered over a very large rpm range, resulting in very smooth power delivery. The single-speed gearbox provides optimal power transmission to the rear wheels and accelerates the BMW i3 Concept to an electronically governed 150 km/h (93 mph) without the loss of power typically associated with having to shift gears. The speed governor cuts in at this point in the interests of efficiency: going even faster would result in very high energy consumption, which would unnecessarily restrict the driving range. The motor is located directly above the drive axle, for optimal and typical BMW rear-wheel-drive handling characteristics. But impressive, instantaneous, response is not the only distinctive aspect about the driving experience in the BMW i3 Concept. Another is the dual accelerator/decelerator function of the accelerator pedal. After the driver eases up on the accelerator, the electric motor acts as a generator, converting the kinetic energy into electricity which is then fed back into the battery. Energy recuperation generates a braking effect which makes a significant contribution to vehicle deceleration. Around town, approximately 75 per cent of all braking operations can be performed in this way, i.e. without using the brake pedal at all. Intensive use of this energy recuperation function of the electric motor can increase the driving range by up to 20 per cent. Only when the driver’s braking request exceeds a given level is the conventional brake system of the BMW i3 Concept engaged as well. A coasting facility makes this unique “single-pedal control” of acceleration and braking using just the accelerator even more user-friendly. The BMW i3 Concept features a distinct “neutral” position of the accelerator pedal, i.e. rather than switching straight to recuperation when the driver eases off the pedal, the electric motor’s zero torque control keeps the drive train disconnected as long as the pedal is in this position. The vehicle now coasts without consuming power, driven by its own kinetic energy. Used as part of a proactive driving style, this coasting mode is a very user-friendly way of increasing the driving range even further. BMW i3 Concept have been reduced by 40 per cent compared with the motor used in the MINI E. This compact drive unit is mounted over the rear axle, together with the power electronics, transmission and differential, causing no loss of interior space. The power needed to drive the vehicle and to operate all other vehicle functions is supplied by specially developed lithium-ion battery cells. The BMW i3 Concept’s battery system has undergone detailed optimisation which significantly reduces the extent to which external factors can influence the vehicle’s power and driving range. An integrated liquid cooling system keeps the battery at its optimal operating temperature at all times, which helps to significantly boost the performance and life expectancy of the cells. The climate/heating system cools the fluid circulating in the battery housing via a heat exchanger. If necessary, in winter, this fluid can also be heated in order to bring the battery up to its optimal operating temperature of around 20 degrees Celsius. These precautions ensure that power and torque remain constant throughout most of the battery’s charge range and make the system significantly less sensitive to extreme external temperatures. The battery can be fully recharged in six hours at a standard power socket. If a high-speed charger is used, an 80 per cent charge can be achieved in just one hour. As the MINI E field tests showed, a driving range of 120 to 150 kilometres (74 to 93 miles) was sufficient to meet 90 per cent of the mobility requirements of the pilot users. However, some customers want a longer driving range, or want their vehicle to be as flexible as possible. The BMW i3 Concept therefore offers an optional Range Extender, the REx, which allows the electric driving range to be increased. REx, a small, very smooth-running and quiet petrol engine, drives a generator which maintains the battery charge level and therefore extends the range of the electric motor. As soon as the battery charge reaches a critical level, REx supplies the necessary energy to get the driver the rest of the way to his destination. In a sense, therefore, the Range Extender is like having a reserve fuel can on board. The very compact size of the electric motor used in the BMW i3 Concept means there is room left over to accommodate REx and its attached generator over the rear axle, alongside the drive components. The petrol engine complies with the SULEV standard, currently the strictest emissions standard for internal combustion engines. To reduce fuel consumption to a minimum, REx also features such functions as Automatic Start-Stop and other intelligent operating strategies. Whereas the BMW i3 Concept always drives on electric power, the i8 Concept combines the advantages of two different drive systems – an electric motor and an internal combustion engine. As a plug-in hybrid it offers the best of both worlds, combining maximum efficiency with maximum performance. A 0-100 km/h (62 mph) acceleration time of under five seconds, combined with fuel consumption in the European test cycle of less than 3 litres/100 km (approx. 94 mpg imp) and average real fuel consumption of between five and seven litres (40 – 56 mpg imp) even with a fast driving style are figures unrivalled by any conventional internal combustion-engined vehicle in this power class. Depending on charging habits and the nature of the route, it is even possible to improve on these figures. The secret is the intelligent configuration of the two drive units. In the BMW i8 Concept, the electric motor is not a secondary power source but an equal partner of the internal combustion engine. In this way the BMW i8 Concept achieves a new, ideal balance between the two drive units which results in an optimal combination of efficiency and dynamism. BMW i8 Concept reflects the outstanding expertise of the BMW Group in the development of both engines and electric motors. The energy supplied by the application-designed battery system installed between the front and rear axle modules to the electric motor at the front axle gives the BMW i8 Concept an all-electric driving range of approximately 35 kilometres (20 miles). The battery can be fully recharged in two hours at a standard power socket. The electric motor of the BMW i3 Concept has been specially modified for use in the plug-in hybrid power train of the BMW i8 Concept, i.e. for operation with a smaller battery pack and in conjunction with an internal combustion engine. A highlight of the BMW i8 Concept is the high-voltage generator attached to the internal combustion engine, via which the internal combustion engine can generate power for recharging the batteries. This option is only used to increase the range of the vehicle while out on the road, and is not intended as a substitute for stationary recharging at an electric power socket. Maximum performance in all driving situations. Although the BMW i8 Concept has all-electric capability, the big attraction of this vehicle lies in the combination of the two different propulsion systems. The BMW i8 Concept combines the high-torque responsiveness of an electric motor with the power of an internal combustion engine, a field in which BMW has specialised for many decades. The BMW i8 Concept makes the most of the specific advantages of the two propulsion systems, which complement and support each other perfectly. The two power sources dovetail smoothly to compensate for any loss of power during gear changes. The combined result is that the BMW i8 Concept provides very dynamic acceleration performance across the entire road speed range. All four wheels of the BMW i8 Concept can be driven at the same time, similarly to an all-wheel-drive vehicle. This solution combines the driving dynamics advantages of front-wheel drive, rear-wheel drive and all-wheel drive. An optimal drive configuration can therefore be provided to suit all driving situations. When accelerating on dry roads, for example, maximum traction is available at all four wheels, resulting in better driving dynamics and driving enjoyment even when pushing the vehicle hard. In winter, too, the two separately driven axles provide benefits, the four intelligently driven wheels making for enhanced safety on slippery roads and keeping the vehicle moving under almost all winter conditions. The fact that the electric motor is located at the front axle of the BMW i8 Concept optimises braking energy recuperation, since the front axle is where greater braking forces are developed due to the dynamic wheel load shift when decelerating. Whenever there is a chance to recuperate braking energy, intelligent driving dynamics systems make the most of it, taking into account traction conditions and driving situation, without compromising stability and dynamics. This allows very high levels of braking energy recuperation even in the wet or in snow. Depending on requirements, braking is initially provided by the recuperation function and only when more powerful braking is required is the conventional brake system engaged. BMW i embodies the creation of visionary vehicles and a new understanding of premium mobility underpinned by sustainability. This can be seen and experienced in the inspirational design of BMW i vehicles. The task for the designers was to develop a unique design language for BMW i which would reflect the new sub-brand’s claims and values and include scope for expansion, but which would also maintain a strong link to its parent brand. The aim was to create an authentic visual representation of innovative technology and to translate values such as lightness, safety and efficiency into the BMW i3 Concept and BMW i8 Concept models. These basic values are expressed in the design of the vehicles through features including large transparent surfaces and a light-bathed interior, a powerful stance and aerodynamic additions such as contact surfaces, spoiler lips and elements allowing air through-flow. The BMW i3 Concept and BMW i8 Concept also blend in their own interpretation of familiar BMW design features, cementing a clear link to the BMW parent brand. An overview of hallmark BMW i design features: The BMW i badge. BMW i is the embodiment of “next premium”, which extends the idea of premium to encompass future requirements. To this end, a three-dimensional blue ring has been added to the outside of the BMW badge for BMW i. Here, the colour blue fulfils two functions. On the one hand it has a traditional association with the BMW badge, but it is also familiar from concepts such as Efficient Dynamics, clean drive systems and zero emissions. The BMW i badge therefore creates a stylistic link between the parent brand and its claim to expansion while giving the sub-brand’s story the perfect visual headline. The BMW i logo was developed by BMW Design on the basis of an idea born within the walls of BMW Group DesignworksUSA. The design of the logo accurately conveys the sub-brand’s character. “i” is the smallest letter in the alphabet, but the logo’s designers have given it a little extra presence by framing it as a transparent cutout. This fits in rather neatly with the ideas of openness and transparency underpinning BMW i; customers can see and explore the theme of sustainability in all aspects of the sub-brand, its logo included. BMW i design features at the front end. The kidney-shaped radiator grille is a signature design feature of the BMW brand. And as such, it is also a fixture in the front of BMW i vehicles. The sub- brand’s models come with a stylistically modified and strikingly individual update on the kidney grille theme, and add a blue background to the design. The innovative drive concept of the BMW i vehicles removes the need for large cooling air intakes at the front, and the grille area is therefore shielded off. The distinctively shaped LED headlights at the outer edges of the front end redefine BMW light design. Along with the strikingly revised kidney grille, the LED-backlit U-shaped lines form an important part of the eye-catching new BMW i face. The minimalist interpretation of the front end highlights the efficiency and lightness of the vehicles and lends them an appearance all of their own. The aerodynamically optimised “stream flow” represents one of the most striking design themes of the BMW i vehicles. Like the Hofmeister kink favoured by its parent brand, this new C-pillar treatment can be viewed as a signature styling cue. Two horizontal lines converge from above and below – like streaks of air in the wind tunnel – into a dynamic C-pillar sweep, lending visual form to the efficient aerodynamics of the BMW i vehicles. BMW i design features at the rear. BMW i also introduces a fresh take on the classically BMW L-shaped tail lights. Their new design maintains a clear association with the parent brand, yet at the same time gives the rear its own individual presence. The distinctive tail lights make a clear statement of BMW i family membership – during the day or night. The design language of the BMW i concept cars: Exterior design. The most defining element of the BMW i models is their purpose-built basic construction, the LifeDrive architecture. Within this concept, the CFRP Life module houses the passenger compartment, while the Drive module brings together all the operational driving functions. This distinctive two-way split is also reflected in the design of the cars. The modules are partly covered by side panels, but remain clearly distinguishable. Expressive surfaces and precise lines form a harmonious transition between the two. This overlap and interlocking of surfaces and lines – “layering” in BMW i speak – marks out the exterior and interior design of both vehicles. The striking interplay of lines and surfaces highlights the linking together of the individual structures and their arrangement within the framework of the LifeDrive architecture. Added to which, the different functions of the layers are colour-coded. The silver external panelling makes up the outward-facing level, while the black function layer of the exterior contains the windows, basic structure and supporting elements. In between, surfaces in bright Stream Blue – the colour used for the BMW i logo – lend high-quality touches. The various levels are set apart from each other clearly, the lower layers also performing certain functions, such as air channelling. The perceptible difference in height between the layers lends the exterior an extremely dynamic, three-dimensional appearance. The Life modules of both concept cars come across as bright and open thanks to their large, transparent surfaces. This high degree of transparency imbues them with an airy feel and – together with the generous portions of exposed CFRP on display – reflect the lightness and efficiency of both vehicles. A transparent roof opens both vehicles to the sky and generates a very open driving feeling. This reveals the intricate CFRP structure of the roof, adding further emphasis to the lightweight design concept of the two vehicles. The generously-sized glass surfaces give an optimum view out of the cars and allow the passengers inside to experience the outside world while on the move. At the same time, admirers on the outside can also see clearly into the cars, effectively turning their interior into part of the exterior design. 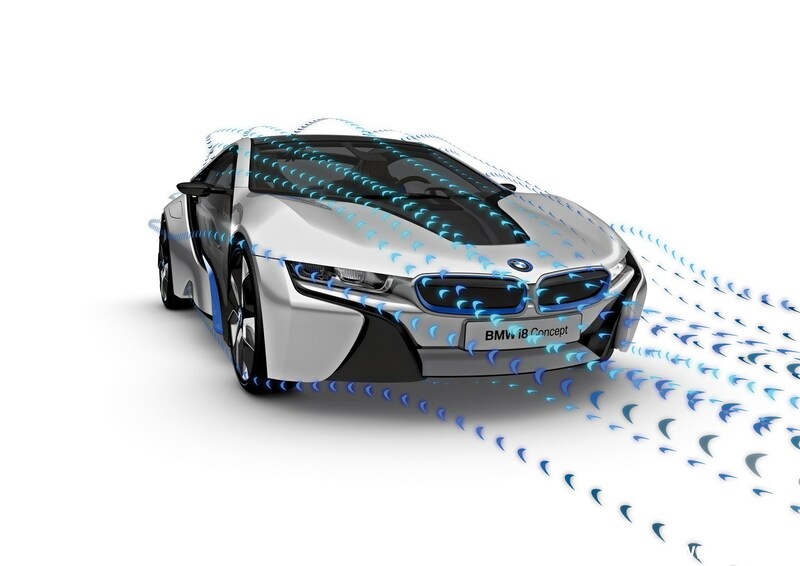 Aerodynamics are an important element of efficient mobility and therefore of BMW i. Indeed, they play a key role in giving the BMW i cars their lower fuel consumption and impressive range. The importance of aerodynamics is also reflected in the two models’ exterior design. The “stream flow” – the striking transition of the greenhouse into the C-pillar – is a nod to the vehicles’ efficient aerodynamics and imbues the side view of the cars with an extra dose of dynamism. The aerodynamic form of the stream flow on the BMW i8 Concept significantly improves its aerodynamic efficiency; integrated into the BMW i3 Concept it improves all-round visibility. Meanwhile, the underbody of the two vehicles is totally enclosed and has a smooth surface to counteract the under-car turbulence that would otherwise push up fuel consumption. Moving further back, the structures above the tail lights and the large air outlets underline the reduction in drag achieved over the vehicle as a whole. Another stand-out feature of the BMW i vehicles are the conspicuously large and relatively narrow wheels. In addition to significantly lower drag, these wheels also give the cars a very solid and dynamic appearance. Other aerodynamic elements include the AirCurtains, which ensure optimum air flow around the wheel arches, and the aeroflaps in the door sill area behind the front wheels. Both solutions reduce the cars’ drag substantially, and in so doing increase their efficiency – and therefore their range when running on electric power alone. As with the exterior, the design principle of layering – the interplay of powerfully expressive surfaces across several levels, defined by precise lines – is also at work in the interior. The interior consists of three different levels, which allow a range of functions to operate and shape the way in which they do so. The three layers have different colours to indicate which functions they accommodate. The layering concept from the car’s outer skin therefore continues inside and highlights the shared design elements of the interior and exterior. The outer level – the white layer – forms the supporting structure for all interior geometries. The elements it contains give the impression of almost being folded, exude a feeling of lightness and yet are very strong. The inner layer is the function-oriented level and opens up features such as seat surfaces and storage areas. The instrument panel includes an additional black level between the inner and outer layer, which incorporates the technical components. This technical layer runs through the whole front section of the interior and also creates a visual link between the instrument panel, steering column and steering wheel (including instrument cluster), central information display (CID) and controls. Positioned here are features including the openings for the air vents, while the displays and radio/climate control panel also develop out of this layer. All in all, the exterior and interior of the two vehicles paint an extremely harmonious picture. The designers worked very closely together during the design process, and consequently the exterior and interior have much in common. Open the door and the boundaries of the interior and exterior begin to blur in the interplay of surfaces, for example, creating harmonious connections between the vehicle areas. The surfaces of the exterior and interior melt into one another in the clearly designed entry area. And when you close the door again it is still possible to see through these surfaces onto – or, more precisely, into – the interior. Another element that brings together the inside and outside of the cars is the partly visible carbon frame. Opening the doors reveals the frame and creates a link between the interior and exterior. The CFRP possesses a highly functional appearance in both vehicles, with the composition and structure of the relevant parts clearly exposed. In contrast to the exposed carbon components with three- dimensional web structure familiar elsewhere, here you can see the load-bearing, two-dimensional weave of the CFRP preforms. The colours and materials concept creates another link between the vehicles – and between their exteriors and interiors. The dominant colours of the exterior are the Silver Flow shade of light silver and High-gloss Black. The slightly blue- tinged, bright silver colour tone shows off the vehicles’ technical, modern exterior design extremely effectively and presents a clear contrast against the black- painted surfaces. It gives a feeling of motion, adds contours to the expressive surfaces and lends the vehicles an impressive visual depth. Contrasting touches in bright, forceful Stream Blue bring the efficiency of the vehicles (inside and out) stylistically to life. Externally this colour can also be found in the logo, the kidney grille, door sills and rear apron. Together the various shades produce an extremely high-class exterior impression, maximising the impact of high-gloss surfaces and the contrast of black, silver and blue. The glass surfaces further highlight this contrast. Applied more discreetly in the interior, Stream Blue glows subtly from the logo in the steering wheel, the seats, and between the leather surfaces and structural layers of the steering wheel, as well as from the indicators and displays. The blue double-stitching on the seats packs a considerable visual impact, divides the seats stylistically into their different sections and creates an effective transition from the backrests to the doors. The colours of the interior paint a far warmer picture and therefore create a pleasant contrast to the technical cool of the exterior. The plastic layer structures in Porcelain White and the warm dark brown leather colour tone Mocha Brown conjure up a modern yet cosy ambience. The soft, exquisite leather has been naturally tanned without an additive in sight. However, it is also used extremely sparingly in the interior of the two vehicles, only covering those areas which will see direct contact with passengers – such as the seats and inner sections of the instrument panel. A stand-out feature of the BMW i3 Concept interior is the visible use, for the first time, of renewable and naturally treated raw materials. This allows the vehicle to express the brand’s claim to sustainability throughout its value chain in stylistic terms. The BMW i3 Concept sets new benchmarks in the use of sustainable materials. In addition to the extensive use of natural fibres in the floor pan and naturally tanned leather, 25 per cent of the weight of the interior plastic is accounted for by recycled or renewable raw materials. All in all, this is another great opportunity taken when it comes to reducing the environmentally damaging CO2 emissions of the cars. greenhouse tapers towards the rear and, together with the rearwards-rising door sills, emphasises the car’s dynamic inclinations. Above the greenhouse, the “stream flow” – a dynamic stroke descending from the roof into the C-pillar – adds further urgency to the forward-surging stance. From the outside, a flowing silhouette and long wheelbase hint at the extraordinarily generous levels of space on offer in the interior, while short front and rear overhangs make parking in tight spaces that much easier. Practicality gets another boost from the “coach doors”, whose opposing construction creates a fresh new way of accessing the wide- open spaces of the interior. Extensive glass surfaces and black elements like the window surrounds and door sills give the vehicle a feeling of lightness and, together with the exposed carbon structures, draw attention to its low weight. At the same time, the lack of B-pillars ensures a seamless transition between the two doors. The result is a large, homogeneous glass surface, which gives the car’s flanks a very transparent look. Large, narrow 19-inch wheels add further impact to the dynamic side profile of the BMW i3 Concept. Their slim construction allows them to reduce the car’s drag and rolling resistance, and to avoid encroaching into the interior. And that means more space for the passengers. The front end of the BMW i3 Concept has a very clear and uncluttered design. The dominant element here is the strikingly moulded kidney grille, which has the hallmark BMW i blue background and – thanks to the car’s all-electric drive system – is totally blanked off. The grille also has a conspicuous swage line picking up from the bonnet edge. Below the kidney grille, the silver-coloured outer layer lends the sculptural front apron its form. The precise, vertical edges of the front apron element serve as the vehicle’s side borders and reinforce its powerful stance on the road. Black surfaces identify the functional areas of the front end, such as the load compartment under the bonnet and the air inlets. The eye-catching LED headlights usher in a fresh take on BMW light design. Along with the strikingly formed kidney grille, the U-shaped LED-backlit lines form an important part of the arresting new BMW i face. The minimalist interpretation of the individual headlights underlines the efficiency and lightness of the BMW i3 Concept and lends it an individualist, outward-looking and reputable air. The rear end of the BMW i3 Concept represents a microcosm of the car’s impressive functionality overall. The large, retractable rear window offers optimum access to the luggage compartment, and the roof pillars stand upright to create as much space as possible in the interior. Its large glass area allows the rear window to offer unbeatable rear visibility. The rear window is also home to the tail lights, which are U-shaped (like the headlights) and appear to be floating in the glass. Behind it lies an extremely versatile boot area, whose capacity can be further increased by folding down the rear seats. The version of the LifeDrive architecture that underlies the BMW i3 Concept opens up totally new avenues in interior design. Since the battery is located entirely in the underfloor section of the Drive module, the whole of the Life module is given over to the interior – a further benefit of purpose-built design. There is no centre tunnel bisecting the cabin, and the interior creates a very free, open and airy impression. At the same time, the design of the interior is extremely modern and clean: taut lines, powerful contours and small radii dominate the geometric forms on display. Here again, the Porcelain White support structure, black technical level and comfort section with Mocha Brown leather are split into separate layers. seats. The full-width seat benches in the front and rear create a new and connecting feeling of space for the passengers in the light interior. With the benches stretching like bridges across the interior, passengers no longer sit strictly apart. This layout also allows them to swap from one side of the car to the other and, if necessary, to all climb out of the car comfortably on the same side. This represents a major boost to comfort in tight parking spaces and when access to one side of the parked car is impeded. The front seat bench features delicate-looking seat backrests marking out the driver and front passenger seats. The slim backrests are a faithful expression of the car’s systematic lightweight design and, at the same time, create more legroom for the rear passengers. The backrests are only connected with the seat bench towards the centre. At their outer edges they appear to be floating freely, which further underlines the airy character of the interior. Another special design element are the blue straps behind the seats, which run diagonally across the backrest and offer another functional stowage facility. A distinctive element of the light interior is the freestanding steering column, around which all the other elements are grouped. Its pared-down surroundings leave the steering column to extend out prominently into the interior, while cut- outs in the column add to the airiness of the interior. All the driving-oriented controls – such as the instrument cluster, start/stop button and gearshift lever – can be found on the steering column. The gearshift lever takes the form of a rotary controller which can be moved forward or backward to select the desired driving mode – the car moves in the direction indicated by the controller. Positioning the controls on the steering column removes the need for a centre console in the BMW i3 Concept, and integrating the iDrive Controller into the seat bench eliminates this dividing element between the driver and front passenger. Another functional detail is the cupholder, which is integrated to the left of the driver in the air vent. This neat solution allows drinks to be kept warm in the winter and cooled by the climate control system in the summer. Contrasts as a calculated design element. Taken as a whole, the interior – with its warmer colours – provides a pleasant contrast to the cool and technical air of the exterior. And there are many other contrasts to be found when you get down to the details. Behind the steering column the extremely intricate yet extensive instrument panel spans the interior. It begins at the air vents next to the steering wheel, continues in a line around the steering column, includes the radio and climate controls, and continues on its path to the front passenger. Shortly before the front passenger door it then shears upwards, heads back towards the centre of the interior and reaches the end of its journey in the central information display (CID) monitor positioned above the control panel for the radio and climate system. Connectivity – the linking up of the driver and passengers with the outside world and information superhighway – plays an important role in the BMW i3 Concept, and is a theme given prominent treatment by the interior designers. For example, the instrument panel generates an almost calligraphic surface design around the displays, one large, wide surface sweeping prominently into a narrower and more delicate counterpart, before culminating in another wide section. The CID and control unit therefore present an attractive contrast to the clear, precise borders of the instrument panel. The area around the instrument panel, the doors and the floor area of the BMW i3 Concept also features contrasting materials. The entire lower area of the BMW i3 Concept interior consists of renewable raw materials. The natural origins of the high-strength dark anthracite material made from compressed and coated plant fibres are clearly evident and showcase the light and beautifully crafted elements of the interior to optimum effect. The subtle background sets off individual elements such as the instrument panel and door pockets extremely effectively and, at the same time, underlines their function. The dark Mocha Brown leather also provides a pleasant contrast with the Porcelain White support structures of the seat bench and instrument panel, and brings a homely lounge character into the vehicle. A large, light-grey wool felt floor mat with blue trim completes the warm and cosy feel. A further contrast to the transparent, pared-down design of the interior is provided by the support structure in the roof, whose organic, branched-out appearance recalls the myriad tentacles of a road network. Interface design delivering intelligent mobility. stations. The freestanding instrument cluster, meanwhile, emerges out of the steering column directly in front of the driver. With a 6.5-inch (16.5 cm) screen diagonal it displays all the relevant driving information in the driver’s field of vision. Its freestanding design generates a very free and open feel around and above the driver’s head. Meanwhile, the central 8.8-inch (22.4 cm) information display curves out of the black technical layer of the instrument panel’s upper section towards the passengers. It blends seamlessly into the black surrounds, creating a very high-quality, continuous black surface which makes the display appear even larger. Below, the likewise unbroken black audio/climate control panel shares the form of the central information display (CID). Like the CID, the homogeneous touch-control surface curves towards the passengers and uses another screen to show additional information relating to the content on the central information display. On another level, the highly technical-looking display graphics of the instrument cluster and CID lend visual form to the BMW i3 Concept’s electric drive philosophy. All the information is displayed in the high quality and visually appealing fashion you would expect from BMW. Although the relationship of the i3 Concept to the parent brand is clearly evident again here, a very distinctive graphics profile has been created for BMW i with the emphasis on an individual and minimalist approach. All the displays are three-dimensional. The efficiency display, which takes the form of an open-topped ellipse, surrounds the digital speed screen in the centre of the instrument cluster. Its gauge tells the driver whether energy is currently being taken from the battery or supplied to it through recuperation. The driver can also find information here on the car’s remaining range and driving mode currently selected. If the driver switches to range- enhancing ECO PRO mode, the whole display concept also changes. The ellipse in the instrument cluster becomes flatter, the projected range increases and a display showing the optimum accelerator position for efficient driving completes the new format. The climate control panel also provides visual confirmation of the function-related changes in ECO PRO mode. The driver is therefore kept very effectively informed and given the best possible support in every driving mode. The design of the BMW i8 Concept is as special as the car’s overall concept, embodying the perfect synthesis of technology and aesthetic allure. Its sweeping lines and flat silhouette lend the vehicle a strikingly dynamic appearance even when standing still. Taut surfaces and precise edges combine to form an extremely sculptural and organic surface structure. The BMW i8 Concept appears to have been cut from a single mould, with the front end, flanks, rear end and roof flowing smoothly into one another. Dynamic surfaces and forms generate attractive light and shadow effects, which add emotional emphasis to the car’s light and sporty character. A large, transparent greenhouse lends the exterior an extraordinary feeling of lightness and highlights the exceptional efficiency of this vehicle concept. Short front and rear overhangs round off the sporting overall impression. Despite its dynamic appearance, the 2+2-seater can accommodate four people, giving it a high degree of everyday practicality. As with the BMW i3 Concept, layering again serves as the central design element of the interior and exterior. The individual vehicle components are also clearly visible from the outside, the black and transparent Life module clearly setting itself apart from the silver-coloured body components around it. The overlapping surfaces and carefully positioned joints enable a reduction in the number of parts required and therefore also a drop in the car’s weight. Indeed, the airflow-optimising surface structure can meet aerodynamic requirements without the addition of extra body elements. This layering approach lends the BMW i8 Concept an extremely technical and cutting-edge appeal. The precise lines along its flanks and hallmark BMW i “stream flow” give the BMW i8 Concept a strong sense of powering forward even when it is standing still. Plus, the compact packaging of the electric motor over the front axle has allowed the designers to give the car an extremely low and aerodynamically efficient front end. The BMW i8 Concept’s doors swing upwards like wings to provide an undeniably emotional and sporting allure. The high-strength carbon passenger cell allows large door openings which give access to the front and rear seats at the same time. Like the rest of the exterior, the construction of the doors is shaped by the overlapping of several layers of material. Below the doors, the silver-coloured layer moulds the car’s flanks into a powerful wedge shape, opening out from the door sills towards the rear. A blue flourish accentuates the dynamic presence of the sills. Together, the bonnet and door sill sculpting emphasise the BMW i8 Concept’s forward-surging stance, and their smooth lines imbue the car with an extra lightness. The BMW i8 Concept also displays its dynamic sports car persona when viewed from the front. A number of different levels interact with one another in the design of the front end, while sculptural air intakes and channelling ducts evoke a feeling of depth. The expressive surface treatment exudes dynamic verve and advertises the car’s sporting potential. The broad kidney grille and flat headlights emphasise the car’s low-slung and dynamically wide-set stance. The full-LED headlights of the BMW i8 Concept also adopt the signature BMW i U-shape with two adjacent arches. Set back slightly into the body and framed by a U-shaped surround, the headlights give the car a sporty and urbane appeal. Similarly to the front end, the rear of the car is also very low, horizontal and sculptural in design. The silver-coloured side sections form a striking vertical frame around the rear of the car, with a precise line extending out to the sides enjoying particular prominence. This line also serves as a spoiler lip and emphasises the aerodynamic efficacy of the rear end. In its centre the silver- coloured and blue-framed rear diffuser is a wider and lower interpretation of the version on the BMW i3 Concept, adding a distinct sporting flavour to its relationship with its stablemate. In this area of the car the exceptional sporting credentials of the BMW i8 Concept are expressed in width-accentuating lines, three-dimensional air outlets and “floating” tail lights with air through-flow. The tail lights, which also have a distinct horizontal design, are integrated into the upper layer of the rear and share the signature U-shape of the BMW i light concept. BMW i8 Concept: putting the dynamic into aerodynamics. The transparent surfaces in the doors and roof give the exterior and interior design of the BMW i8 Concept the appearance of merging into one another. The clear forms of the interior provide an attractive contrast to the dynamically flowing exterior and lend the cabin a special lightness and dynamic flair. The colour concept and underlying structure of the BMW i8 Concept interior closely mimic those of the BMW i3 Concept. Here again, the Porcelain White support structure, black technical level and comfort section with Mocha Brown leather are split into three different layers. Stream Blue touches on the centre console, instrument panel and seats lend stylistic expression to the efficiency and sustainable character of BMW i in the interior. Naturally tanned leather and warm colours underline the light, high-quality and sustainability-focused ambience inside the BMW i8 Concept. A light felt with three-dimensional meshing provides the floor covering and emphasises the dynamic flavour of the interior as a whole. and controls. The three-dimensional displays are extremely clear and flash up the relevant information for the driving situation at hand. At the same time, occupants in the BMW i8 Concept sit in a highly integrated position low down in the car and are separated by the battery running lengthways through the interior. This longitudinal bisection of the cabin underlines the sporting and forward- looking character of the BMW i8 Concept interior. Like a road map above the passengers’ heads, the organic, longitudinal structure of the transparent roof reflects the inspiration for the car and its key focus on delivering a dynamic driving experience. The driver-focused design can also be seen prominently in the distinctive layering of the interior. Surfaces, levels and joins form functional areas and mark them out from one another. For example, the interplay of various levels gives the driver’s area a very three-dimensional design and clearly sets it apart from the front passenger area. In a clear gesture towards the person behind the wheel, the lines around the driver all converge into the binnacle to form an extremely focused driver’s position. Driving functions such as the gearshift lever, start/stop button and parking brake are arranged around the driver on the centre console and are also extremely driver-oriented graphically. The driver’s position also dominates a second level within easy reach of both driver and front passenger. This is where they will find the iDrive Controller with touch-control surface and the climate control unit. The central information display, meanwhile, is positioned above the instrument panel. The freestanding design of the unit gives it a particularly intricate and high-quality feel. The instrument panel integrates the controls for the audio and climate control system almost seamlessly into the surrounding surface. They are illuminated with LEDs, giving them a very pure touch-control look. However, their button-based design allows them to provide feedback through the fingertips, accentuating the sporting character of the BMW i8 Concept. exposed carbon in the Life module, emphasises the car’s low weight. The rear seats are fixed solidly to the floor, but at first glance they appear to be floating, giving this area of the car a light and contemporary feel. Two large displays give the driver access to the relevant information for the driving situation at hand and help him to operate connectivity-related applications. The 8.8-inch (22.4 cm) central information display is joined by an equally large display taking the role of the instrument cluster. Indeed, its high- quality presentation in the binnacle makes it look far larger. In normal driving mode the two drive systems are depicted by a pair of ellipses, which supply information on their operation at any given time. Other information – such as the available range and fuel level – can be found here, too, and the driver can also call up three-dimensional navigation instructions in addition to the other readouts. The displays in this area share the high-quality, modern and pure design which has been established as a hallmark of BMW i. In ECO PRO mode the displays turn blue in colour, confirming the change in functional emphasis, while an efficiency display tells the driver how much further the car can travel before recharging or refuelling, and shows the optimum accelerator position to maximise efficiency. If the driver switches to Sport mode, the colour of the display information changes to orange and the ellipses rotate and point in the direction of travel. A large readout of the car’s speed is displayed digitally between the ellipses. This extremely dynamic display concept brings the emotional driving experience to the screens and, with its uncomplicated approach to showing information, helps sharpen the driver’s focus on the primary task at hand. In every driving mode, this display concept ensures the driver is shown the information he requires at that moment in time to do the best possible job of piloting the car. Sustainability has played a defining role in the BMW Group’s strategy and operations ever since the early 1970s. Since that time, many production processes have been optimised and many innovative technology packages incorporated into the company’s vehicles, which have significantly reduced emissions both during the manufacturing process and during the useful life of the vehicle. But sustainability is not confined solely to environmental issues. The BMW Group addresses all three dimensions of sustainability: environmental, economic and social. On sustainability, the BMW Group’s strategic action areas not only include reducing emissions but also ensuring sustainable innovation and growth, shaping the future and gaining access to new technologies and customers. In all of this, our employees play a key part. It is their passion and expertise which pave the way for groundbreaking innovations. Investment in ongoing employee training, equality of opportunity and lifelong learning are therefore an important priority for the BMW Group. The Group is also committed to promoting health and to cultural and intercultural development both inside and outside the company. Just how successful the BMW Group has been in its actions to promote sustainability is clear not least from its position in the Dow Jones Sustainability Index: in 2010 the BMW Group headed this ranking list for the sixth time running, making it the most sustainable company in the automotive sector. For BMW i, sustainability is of pivotal importance. A holistic approach to the issue of sustainability is a defining feature of this sub-brand. BMW i aspires to sustainability throughout the entire value chain. From the earliest strategic and planning stages, therefore, clearly defined sustainability targets were set for the BMW i vehicles. All three sustainability aspects were addressed across the entire spectrum, from purchasing, development and production to sales and marketing. This process had its beginnings in project i. Employees working for this think tank play an enabling role in the BMW Group’s development of new technologies and processes designed to provide sustainable mobility and to ensure sustainability throughout the value chain. This research work has resulted in an all-electric vehicle based on an innovative architecture, new materials and a completely new production process. This vehicle is the BMW i3 Megacity Vehicle. In their quest for a completely sustainable process, the BMW Group specialists began by looking at the entire vehicle life cycle. They quickly identified potential for reducing environmental impacts and went on to define concrete targets, as a benchmark for measuring and monitoring progress. In the subsequent vehicle development process, these sustainability targets were given the same priority as cost and weight targets. This is the first time a vehicle project of the BMW Group has implemented such an approach so radically, so extensively and so systematically. The BMW i3 Concept proves beyond doubt how successfully these sustainability targets were achieved. The life cycle global warming potential (CO2e) of the BMW i3 Concept, assuming a European electricity mix (EU 25), is at least a third lower than for a highly efficient combustion-engined vehicle in the same segment. If the vehicle is powered by renewable electricity, the improvement increases to well over 50 per cent. In addition to global warming potential, other environmental impact categories have been taken into account as well. This is reflected in a large number of innovative measures relating to the development, production and recycling stage. Some of these solutions were developed by suppliers. In this way BMW i is setting new standards of sustainability across the entire value chain. “The new directions being taken by BMW i – including the LifeDrive architecture, the drive units, the production methods and the use of sustainable materials – all help to reduce the global warming potential (CO2e) of every single vehicle.” (Simone Lempa-Kindler, Responsible for sustainability at project i). With its innovative LifeDrive architecture and extensive use of intelligent lightweight design, the BMW i3 Concept is specifically targeted at electric mobility. This purpose-built design, which compensates for the weight penalty of an electric power train, also features innovative use of CFRP (carbon fibre-reinforced plastic). The weight savings ensure an extended driving range and even more efficient zero-emission electric operation – in other words, more miles per kilowatt of electricity. At the same time, sustainability is also reflected in the high-class interior, where for the first time the use of renewable materials is clearly visible. Natural fibre-based materials are clearly identifiable in instrument panel and door trim surfaces and details, for example. Along with naturally tanned leather, these materials make this new, “natural” interior aesthetic immediately likeable. The BMW i3 Concept also has a high recycled material content. 25 per cent of the interior plastics by weight have been replaced by recycled and renewable materials, as have 25 per cent by weight of the exterior thermoplastic components, while the CFRP used in the Life Module consists of 10 per cent recycled material. The use of recycled CFRP in this form is currently unique. The BMW Group has for a long time been investing huge efforts in developing a sustainable production system. The aim is to reduce the environmental impact of the production process to an absolute minimum. The criteria against which progress is monitored include energy and water consumption, process wastewater, solvent emissions and waste sent to landfill – in each case calculated per vehicle produced. At the same time the BMW Group also monitors CO2e emissions arising from energy consumption. The goal is to reduce resources consumption and emissions per vehicle produced by 30 per cent over 2006 levels by 2012. However, in the production of its BMW i vehicles the company will be going even further. Compared with the current figures for the BMW Group production network, which has been the benchmark in the entire automotive industry on sustainability for a number of years, the future production plant for BMW i vehicles – Leipzig – will achieve additional 70 per cent savings on water consumption and 50 per cent savings on energy consumption per vehicle produced. 100 per cent of the energy used in production of the BMW i will be renewable. Further opportunity for reducing global warming potential across the entire product lifecycle can be achieved through a carefully focused purchasing strategy for the lightweight materials aluminium and CFRP, which due to the BMW i’s LifeDrive concept account for a much bigger proportion of the total materials used compared with a conventional vehicle. Recycled aluminium, also known as secondary aluminium, and aluminium produced from 100 per cent renewable energy, offer big opportunities for reducing CO2e emissions. By using renewable energy, CO2e emissions per kilogram of aluminium produced can be reduced by 50 per cent compared with a conventional manufacturing process, while the savings from using secondary aluminium are as high as 80 per cent. Wherever possible, therefore, the standard castings for the BMW i3 Concept contain 100 per cent secondary aluminium, while for high-strength structural components and crash management components, 50 per cent low-emission recycled content is used. A total of more than 80 per cent of the aluminium used in the BMW i3 Concept is produced either using renewable energy or from secondary material. In CFRP manufacturing, too, BMW i always uses the most eco-friendly processes. The CFRP produced by our joint venture partner at the Moses Lake plant (USA) is made using electricity generated entirely from renewable hydroelectric power. High standards are also set for the supply chain. BMW i suppliers must demonstrate that their business practices are sustainable and their internal operations must comply with the social and environmental sustainability standards of the BMW Group. Suppliers who perform outsourced development work must also integrate recycling into the product development process. All BMW i processes conform to the principles of closed-loop material recycling and waste avoidance. Looking at the product lifecycle in its entirety, examples of recycling include use of recycled process wastewater in the production process, use of secondary aluminium and use of recycled fabric in CFRP production. End-to-end recycling saves resources and conserves raw materials for future use. Another priority for the development team is to ensure that all structures and processes are designed to facilitate component reuse and material and energy recycling. Just like the environmental and economic aspects of sustainability, the social aspects too were taken into account at an early stage in product development and design. Here BMW i is building on the existing very high standards of the BMW Group and is systematically reinforcing its commitment to three key issues: responsibility for employees today and in the future, commitment to ethical standards in the supply chain, and social responsibility. Important aspects here include curtailing noise exposure and reducing stress through improved workplace design, for example through natural lighting on the assembly line, along with a structured health management policy that takes into account demographic change in the production workforce, provision of special health and fitness programmes and development of retirement models. BMW i – visionary mobility and mobility services. BMW i stands for a new approach to premium mobility. This mobility concept is geared to the demands of the future and to the needs of users, and it systematically addresses these challenges today. It does this firstly through the vehicles themselves, with their innovative architecture, sustainable value chain and innovative drive concepts. At the same time, pioneering driver assistance systems in these vehicles also provide a new dimension in safety and comfort, while application-based remote functions allow the vehicle to be accessed via a smartphone, for example to allow remote charging or remote thermal preconditioning of the battery pack. Driver assistance systems that think further ahead than ever before. A new generation of vehicles calls for a new generation of driver assistance systems. The BMW i3 Concept in particular is designed for stress-free driving around town. Its agile electric motor, together with the characteristic single-pedal control of acceleration and deceleration, and the vehicle’s small turning circle cater optimally to the requirements of urban personal mobility. The BMW i8 Concept, too, which likewise offers an all-electric mode, is ideally equipped for low-emission operation in big cities where strict emissions regulations are in force. Both vehicles also feature highly innovative driver assistance systems designed to make driving – particularly in an urban environment – not only more pleasant but also safer. Proactive Front Protection – earlier braking can save lives. Proactive Front Protection, offered in both vehicles, is an active safety system which helps to prevent accidents or mitigate injuries. The system, which operates across the entire speed range, can detect a collision risk with preceding vehicles and warns the driver in good time, so that he can sharply reduce his speed and, if possible, still avoid an accident. A camera mounted in the base of the rear-view mirror monitors the traffic in front of the vehicle. If, based on the combined data supplied by the camera and by the vehicle, the system detects a collision risk, the vehicle warns the driver by means of visual and audible signals. At the same time the brake system is primed, so that the brakes can respond more quickly and more positively. In the speed range from 0 to 60 km/h (37 mph), the system functionality has been extended – in addition to vehicles, the system can now also detect pedestrians, and in addition to warning the driver it also assists by performing automatic emergency braking. Driver assistance systems for urban driving – Parking Assistant and Traffic Jam Assistant. Since the BMW i3 Concept is designed mainly for urban operation, the vehicle offers two further driver assistance systems that address typical urban traffic situations. The Parking Assistant makes parallel parking even easier and more convenient by performing the entire parking manoeuvre automatically. In addition to the familiar functions of the Parking Assistant systems of today, which simply handle the steering, the Parking Assistant in the i3 also handles longitudinal vehicle control. Acceleration and braking is now performed automatically, and if multiple manoeuvres are required, the vehicle can also automatically switch between forward and reverse direction. Traffic Jam Assistant helps steer the vehicle. following distance from the vehicle in front, and in particularly heavy traffic can autonomously control the speed of the vehicle right down to a standstill. The difference, however, is that in this case the vehicle also provides active steering input. Advanced camera technology allows the vehicle to follow the road, based on the road markings, helping the driver to stay on course right up to a speed of 40 km/h (25 mph) – provided he keeps at least one hand on the steering wheel. For a long time now, thanks to the growth in mobile devices, access to the digital world has no longer been confined just to a home-based computer but has extended to ever more locations, both static and mobile. Courtesy of Connected Drive and the application-based in-car integration of mobile devices via MINI Connected and BMW Apps, digital access is also firmly establishing itself in the vehicle itself. While BMW Group vehicles already provide in-car digital access, this is also a two-way process, since the seamless integration of smartphones or tablets also allows certain vehicle functions to be controlled from outside the vehicle. Using a smartphone, for example, Connected Drive offers remote vehicle locking or unlocking and remote horn or headlight activation in order to locate the vehicle if it is within sight or earshot of the driver. It also allows the vehicle to be located within a range of up to 1,500 metres using the CarFinder function. In addition, navigation destinations provided by Google Local Search can be sent to the vehicle, where they are then available for on-board use. In addition to the familiar Connected Drive remote functions, the BMW i3 Concept and the BMW i8 Concept also offer new features designed specially for electric vehicles. These specific e-vehicle functions include remote- controlled charging and remote-controlled thermal preconditioning of the battery pack and vehicle interior. Remote-controlled charging allows the user to remote- start the charging process at a time that can be controlled by setting the journey start time. The remote-controlled charging function also allows the user to check the battery charge status at any time and see whether the vehicle is currently being charged, what charge level has already been achieved, how far the vehicle could be driven on the current charge level, or on a fully charged battery pack, and also the remaining time until the battery pack is fully charged. Assuming that the user has an appropriate contract with his electricity provider it is also possible to select the type of electricity used, ranging from the greenest to the cheapest type of power. Increased range through intelligent thermal preconditioning. Intelligent thermal preconditioning allows the driver to preheat or cool both the battery pack and the vehicle interior before the start of the journey. There are two advantages to starting the journey with a preconditioned vehicle. Firstly, ensuring that the battery pack is at its optimal operating temperature right from the start maximises battery power and driving range, and secondly the driver can enjoy pleasant temperatures in the interior right from the start of the journey, both in summer and in winter. Thermal preconditioning can either be started in real time or, alternatively, the driver can programme the system in advance by entering the journey start time using the timer function. The software then calculates when to start the process in order to maximise the driving range at the outset of the journey. If the vehicle is plugged in while preconditioning is taking place, the energy will be taken not from the battery but from the grid, which further extends the range. Both the charging and the thermal preconditioning functions, as well as being remote-controlled, can also be activated and controlled manually from inside the vehicle. In addition, a spidergram can be superimposed on the local map to show the user how far he can drive based on the current battery charge level. A marked area indicates which destinations the driver would be able to reach if he practises a conservative driving style. At any time, therefore, the driver can easily estimate how much driving range he still has in reserve. The driver can also display the nearest charging stations which are not currently occupied, and can at the same time book an “appointment”. The address can then be loaded straight into the vehicle’s navigation system. Optimal efficiency and comfort – ECO PRO mode. In both the BMW i3 Concept and the BMW i8 Concept, ECO PRO mode allows the driver to increase the electric driving range of the vehicle and reduce power consumption at the press of a button. Activating the switch on the centre console changes the drive settings and those of the convenience systems for even more efficient operation. ECO PRO mode changes the accelerator response characteristics so that the same pedal travel delivers less power than in the standard mode. The BMW i3 Concept can also cap the top speed at anywhere between 120 and 90 km/h (74 and 56 mph). At the same time the response curves of the heating and air conditioning system are flattened when ECO PRO mode is activated, so that these systems consume less energy. Using ECO PRO mode in the BMW i3 Concept can increase the electric driving range by as much as 20 per cent. ECO PRO + mode for a maximised driving range. If, due to unforeseen circumstances such as a prolonged traffic hold-up, the electric driving range is shortened to the point where the driver can no longer be sure of reaching his destination, ECO PRO + mode engages a drive mode which is geared specifically to maximising the driving range. The main electrically powered convenience functions such as the air conditioning and heating systems are as far as possible deactivated, and auxiliary power consumers such as the heated seats and heated mirrors, or non-essential components of the daytime running lights are shut down altogether. However, the systems continue running with minimal functionality, so that safety inside and outside the vehicle is in no way compromised. For example, the window demisting function remains operational to maintain clear visibility in winter. ECO PRO + mode also activates a further alteration in the drive characteristics, which are changed to an even less dynamic setting, and in addition limits the top speed to 90 km/h (56 mph). However, a special override function can deactivate the speed limiter in an emergency. In these various ways, ECO PRO + mode ensures that all the energy in the battery is used for driving the vehicle, thereby adding crucial miles to the driving range. Proactive energy management in the BMW i8 Concept. Intelligent navigation functions ensure optimal energy management in the BMW i8 Concept, thereby helping to reduce fuel consumption. As soon as a destination is entered in the navigation system, the vehicle calculates the best way to manage the energy consumption of the two power units along the route. On different sections of the route, the vehicle characteristics can then be modified so that the drive units are managed either for maximum efficiency or for optimal performance. The two navigation modes “Last Mile Navigation” and “Intermodal Route Planning” are designed particularly with urban environments in mind. Last Mile Navigation continues to navigate the driver even after he gets out of the vehicle, by sending instructions to his smartphone which will direct him quickly and reliably on the “last lap”, for example from the car park to the museum entrance. And when the driver is ready to head back, he can quickly locate his parked vehicle using the CarFinder function. For drivers looking to use their vehicle in conjunction with public transport, Intermodal Route Planning summarises the various options of getting to a given destination. The aim is to integrate – and utilise the synergies between – the different modes of transport. This BMW Group system integrates the vehicle, the different modes of local public transport and information about current parking availability. If, for example, the city centre is very busy or closed to car traffic, or if there is disruption on the planned route, the navigation system will in future be able to propose an alternative route by public transport, including use of park and ride services. When entering a destination, drivers can also choose between the fastest or the most environmentally friendly way of getting there. When using electric drive, the Intermodal Route Planning service can also take into account charging stations along the way and also offers drivers the option of taking a route which will optimise the vehicle’s driving range. A big advantage of the Intermodal Route Planning service is that it provides very situation-specific navigation which can also be modified at any time if the user’s requirements change. For example, in the event of an unforeseen incident on the chosen route, the parameters can simply be changed and the user will instantly receive an alternative suggestion. This option ensures that drivers are not caught out by congestion or road closures. People’s mobility needs and their personal mobility habits are changing. Congestion, lack of parking, high parking charges, unreliable public transport and a lack of knowledge about unfamiliar towns and cities are an increasing obstacle to mobility. At the same time, there is a demand for mobility solutions which are customised, flexible, always available and above all uncomplicated. BMW i is addressing these changing mobility requirements systematically and on various levels. In addition to the vehicles themselves, a further important component of BMW i will be mobility services, which can also include car- independent services. With these services, BMW i will extend the existing range of vehicle-related Connected Drive services significantly. All BMW i products and services are aimed at facilitating and wherever possible simplifying mobility. With its customised mobility solutions, BMW i sees itself as a mobility “enabler”. The focus is on solutions for more efficient use of existing parking space, intelligent navigation systems incorporating location-based information, Intermodal Route Planning and premium car-sharing. BMW i’s integrated approach to mobility is aimed at providing customers with services that perfectly match their requirements. Nowadays, not everybody in the world’s major urban centres still wants to own their own vehicle, particularly if they are only going to use it occasionally. The state-of-the-art mobility service “DriveNow”, a free-floating car-sharing system, is aimed precisely at this market. The special highlight of this service is that vehicles do not have to be picked up from and returned to specific locations but can be hired and left wherever the customer wishes. This clearly differentiates DriveNow from competitor products. Starting in June 2011, the DriveNow joint venture between the BMW Group and Sixt AG is offering a state-of-the-art mobility service, initially in Munich, whose key features include high-efficiency premium vehicles and an extensive range of services. While BMW supplies the premium vehicles, Sixt provides premium services allowing extremely flexible on-demand vehicle hire and return. Customers can check vehicle availability either on the internet, via a smartphone app or simply when passing by on the street. Vehicles can either be hired on the spot, without booking, or can be booked via the internet or a smartphone app. Conventional car keys are not required either, since the DriveNow vehicles can be unlocked by means of a chip inserted in the driver’s licence and started using a starter button. During the initial phase, the DriveNow fleet will offer a variety of BMW 1 Series and MINI models. These cars are high-quality, four-seater premium vehicles with full luxury specification (including parking aid, automatic climate control, heated seats etc.) and high-efficiency engines. All the cars display the DriveNow logo, making them easily identifiable. In future, electric vehicles will also join the fleet. To cater for users’ specific preferences, as well as free use of public city centre parking, DriveNow also offers free parking spaces at selected multistorey car parks. DriveNow is also aimed at non-BMW customers. DriveNow gives these customers the chance to drive a BMW 1 Series or MINI model without first having to buy one. This will make the BMW and MINI brands more accessible and will introduce more people to these vehicles. In the same way, of course, DriveNow allows existing BMW or MINI customers to continue driving a BMW Group vehicle even when their own vehicle is not currently available, for example if they are in another city and have left their car at home. Car-sharing also helps to reduce the time spent searching for parking spaces and in addition is an alternative to ownership of little-used, elderly and inefficient vehicles. In addition to developing and offering its own services, the BMW Group also provides services in partnership with other companies and makes strategic investments in mobility service providers. This task is now being handled by the venture capital company BMW i Ventures, which was established in early 2011 in New York. BMW i Ventures’ mission is to extend the BMW i product portfolio over the longer term by making equity investments in various cutting-edge service providers. As an investor, BMW i can provide backing for new, promising start-up companies, ensuring that development work on high-potential innovations continues and that these developments can eventually be put to use. This is also a useful enrichment for the BMW Group’s own innovation capacity. The first investment by BMW i Ventures was in the New York-based company MyCityWay. As a mobile app, MyCityWay provides users with information on public transport, parking availability and local entertainment for over 50 cities in the USA, Canada, Europe and Asia. The list of cities will continue to grow in the course of the global market rollout. The second investment by BMW i Ventures was in “ParkatmyHouse”, an internet platform which allows private individuals to rent out their driveway or private parking space on an occasional or permanent basis. By allowing the general public to use private parking spaces, this flexible parking management service reduces the pressure on on-street parking. Finding and renting a nearby parking space, using the internet or a smartphone app, is simplicity itself. With its car-independent mobility services and systematic promotion of innovation, BMW has paved the way for a comprehensive and innovative mobility experience. And it doesn’t stop there: at the same time the BMW Group is also working to intelligently integrate these various services. The underlying idea is to pool the information from all the different services and make it available in the most suitable form for the various target groups. For example, MyCityWay information for tourists visiting an unfamiliar city could be combined with a vehicle provided by DriveNow. Users could then, say, be offered a customised city tour, possibly already uploaded into the navigation system, focusing on specific areas of interest like art, history or architecture. This could be further integrated with parking information from Connected Drive and ParkatmyHouse so that the user could quickly find the optimal parking space for their vehicle.